Vine-ripened tomatoes may be one of the most anticipated treats of summer, and their absence is much lamented once autumn arrives and ripening slows to a standstill. But the good news is that those lingering green tomatoes are tasty in their own right if you know how to prepare them. Tomatoes, ripe or green, were not always so popular. Though Native Americans, who referred to them as tomatl, regularly enjoyed them, Europeans viewed this New World plant with suspicion until at least the 18th century. Since it is a relative of the mandrake and other plants known to be psychotropic or even lethally toxic, they regarded the tomato as an ornamental or at best a medicinal until then. Eventually, though, necessity prompted people to reconsider the tomato as an edible fruit. During the American Civil War, after the fruit had made its way to Europe, it returned to North America and became common here as a useful canned food for soldiers. Eventually, growers began using breeding techniques to improve the flavor and yield of the tomato, and its popularity soon rocketed. You might be surprised to learn that sunny days have very little to do with making a tomato ripen. According to Cornell University, temperature is everything, and neither light nor soil conditions effect fruit color. Optimal ripening temperatures are between 70 and 75 degrees, and too much sun exposure may in fact inhibit the lycopene and carotene production required for the fruit’s characteristic coloring. With the onset of frost, green tomatoes that are fully developed may be harvested and brought indoors to ripen as long as they are kept out of direct sunlight. Those that have not fully developed in shape and size may never ripen and should be used in other ways. They make an excellent substitute for tomatillos in salsa verde and are delicious pickled or battered and fried. 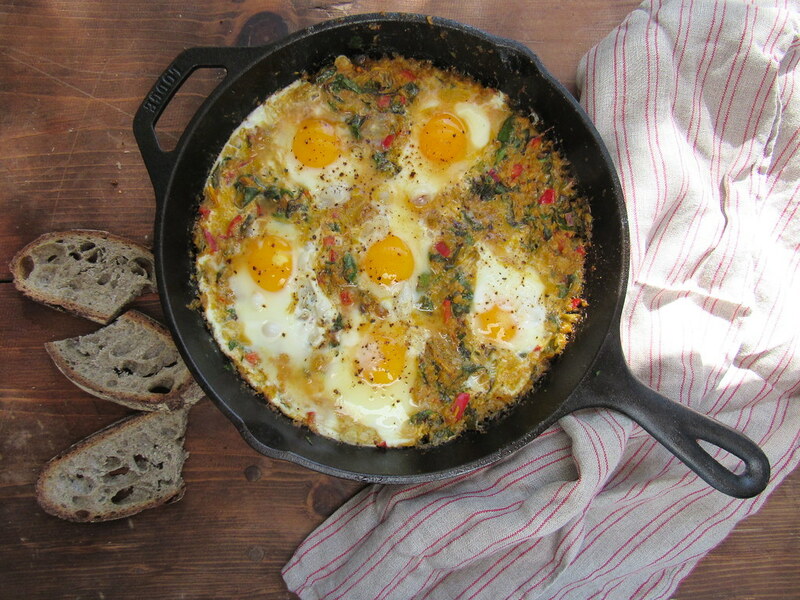 Another option: Make a shakshuka, an Israeli poached egg dish. Traditional shakshuka recipes use red tomatoes, but substituting some green ones adds a bright complexity. 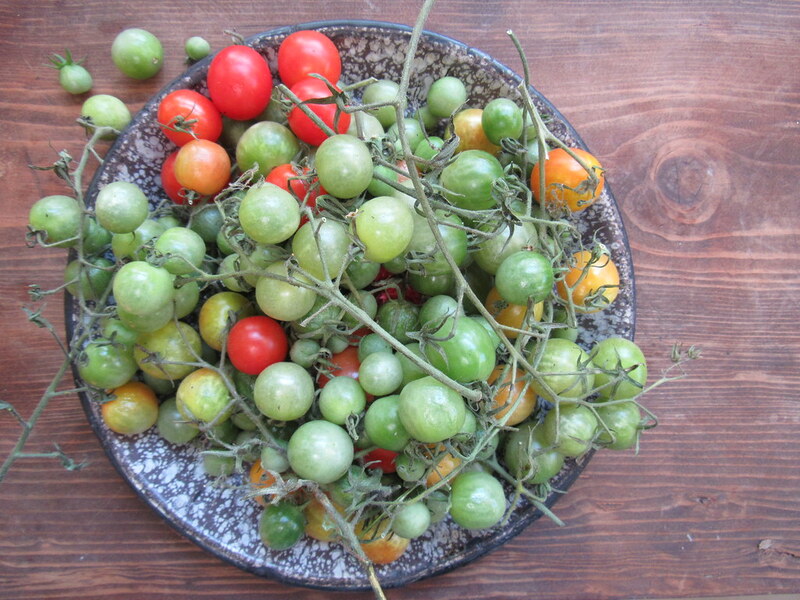 If you don’t grow your own, green tomatoes can also be found at late-season farmers' markets. Served immediately after preparation, this recipe makes an impressive one-pot presentation along with warm pita or garlicky toast points. Place the tomatoes, salt, and spices in the bowl of a food processor and blend on high until a thick salsa is achieved. Set aside. In a 10-inch skillet, sauté the oil and onions over medium heat until soft and translucent, about 5 minutes. Add the garlic and stir until fragrant, about 1 minute. Add the tomato mixture and cream and cook over medium flame until the skins are soft, about 10–12 minutes, stirring occasionally to prevent sticking. Add the peppers and continue cooking for another 3–4 minutes. Stir in the chopped greens and cook until just wilted. Using a spoon, make little divots in the mixture and break the eggs into each depression. Continue cooking on medium until the eggs are to your preference, about 12 minutes for soft yolks. Serve immediately with generous portions of bread and garnished with cilantro and/or goat cheese or sour cream. Green tomatoes. Photo by Sarah Owens.